Japan's getting a slightly different version of Metal Gear Solid V: Ground Zeroes than everyone else. Metal Gear Solid V: Ground Zeroes, the separately sold prologue to the highly anticipated Metal Gear Solid V: The Phantom Pain is out this week. The Western version will feature the vocal talents of actor Kiefer Sutherland as Big Boss, while the Japanese version will keep long-time Japanese fan favorite, Akio Otsuka, in his regular role. But that's not the only difference. Hideo Kojima, in an interview with Weekly Famitsu, mentioned that thanks to the Computer Entertainment Ratings Organization – better known as "CERO" –, the Japanese video game ratings board, part of the Japanese version has been censored. Kojima has mentioned before that the story of MGSV was dark, but apparently, Ground Zeroes went some places that the ratings board balked at. 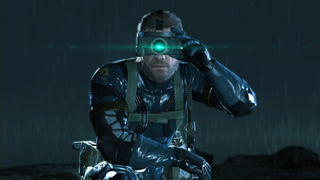 "That part got flagged by CERO so the production was changed that way, but in the North American version [of Ground Zeroes] you can see everything," Kojima said when his interviewer expressed amazement of how far the content of Ground Zeroes went. Anyone who's played through the game, or seen spoiler clips online, can probably guess what got edited, and there are – and will probably be – endless debates on the legitimacy of video game censorship versus the artists' vision. Either way, it looks like I'll be getting a slightly different version of the game than my fellow Kotaku writers. It's not all gloom and doom in Ground Zeroes and Kojima emphasized that there are plenty of silly unrelated missions and extras to lighten the mood. Also, while the MGS series' traditional cardboard box is not in Ground Zeroes, Kojima stated that it would be back in The Phantom Pain. Interviewer: So, Ground Zeroes has been released, but when will the full game, The Phantom Pain be released? He's kidding, folks. Don't worry. Kojima added with a laugh, "[The Phantom Pain] is really vast. We've got so much to do. I get dizzy just thinking about it." I wonder if The Phantom Pain will be different in Japan as well.